The double white thread sewn just above the short fringe at the end of this rug is overcast. 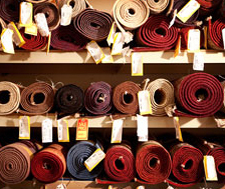 Overcasting is sewn into the ends of a rug to prevent unraveling and the loss of wool pile over time. Excessive wear to the ends of a rug can occur when the same areas are walked across repeatedly. In general, these wear patterns can be avoided by rotating the rug at least twice a year. Putting the overcast in place means that even if the end of a rug does wear heavily, the colored wool knots that compose the rug’s design will not pull off the ends of the warp threads. Across the width of the carpet, bundles of warp threads are tied together with the binding thread. This process is called Persian binding, which is a technique used in Iran to finish the ends of Persian rugs. Persian binding, like standard binding, keeps the end of the rug from unraveling, however, Persian binding also nicely finishes the fringe without knotting. If the rug has Kilim (the white flatweave at the end of the rug) and the ends of the fringe were worn. We will ravel it, in order to create a more pleasing appearance, the fringe knots were untied, and the kilim weave was opened up to reduce the width of the white area at each end of the rug. Persian overcast was then used to finish the ends of the rug. The fringe were wetted and combed to smooth them out, and, when dry, the worn ends were trimmed away. 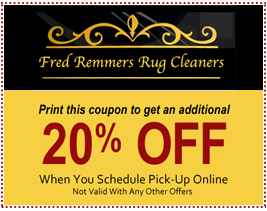 When the ends of your rugs start to look tattered and unkempt, let the rug care team at Fred Remmers Rug Cleaners perform a fringe repair service. Our service restores the overall beauty and quality of your rug. 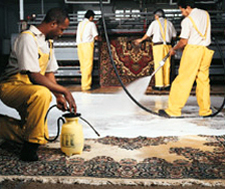 Our team treats your rug with care and respect. We perform all our fringe repair services by hand using the best quality materials and products. When you choose us for your fringe treatment, you receive quality results that last. Everyday use and exposure, coupled with other environmental factors, take a toll on the delicate fringing of your area rug. Due to excess dirt, set-in stains, heavy traffic and sun light, fringing collects messes and easily tears away from the base of the rug. 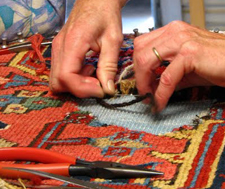 Our rug care experts professionally correct these problems with our fringe repair service. 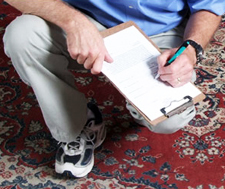 We start with a complete inspection of your rug. This helps us diagnose all problems and determine the correct form of repairs needed. Ready to get started? Give us a call! We also offer other rug repair services.